The foreign ministers expect guns to go silent as of 20 February. 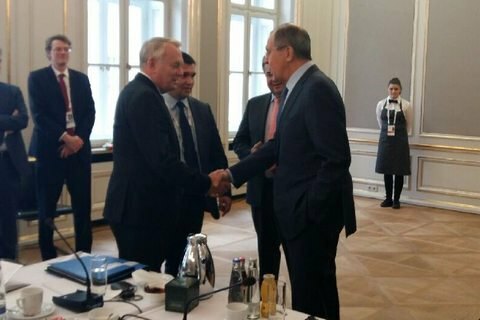 The foreign ministers of the Normandy Four states (Ukraine, Russia, Germany and France) have agreed that the conflicting sides in eastern Ukraine should withdraw arms from the line of contact, and urged the end to the railway blockade in Donbas. The statement to this effect was made by German Foreign Minister Sigmar Gabriel, who took part in the talks for the first time. Germany was previously represented by Frank-Walter Steinmeier who was recently elected president. "All sides agreed to implement the agreements reached by the trilateral group in Minsk on observing the ceasefire, withdrawal of heavy arms and allowing the OSCE mission to monitor it," Interfax-Ukraine quoted Gabriel as saying. "We agreed that the Red Cross would be granted access to captives," he added. "We are calling on railway blockade activists to stop the blockade because it hurts both sides: those who export coal and those who receive it to produce electricity," he said. The previous Normandy Four meeting was held in Minsk on 29 November.